I became a pedicab driver to change myself, and the world. I wanted to become more comfortable talking with people on the street, and I wanted to transport people by an earth-friendly means. As a pedicab driver, I rent a pedicab for $150 per week, and I can drive as much as I want. Evening rush hours and weekends are the busiest times. I pick up my pedicab from the lot on W 31 St. On the job, I coast around Midtown Manhattan looking for passengers. I watch the sidewalk for anyone calling for a cab or about to call, or anyone who seems unsure of what to do next. I ask the person’s destination and try to negotiate a price. Once passengers are on board, I chat with them at every red light and every opportunity. I have carried marathon runners, couples on dates, election voters, tourists, and costumed demons. The hardest part of my job is the “no”s. For every passenger, there are 10 to 100 potential others who say no. Many have good reasons–there are too many people (more than 3), they are going to another borough or the airport (too far), or they have only a credit card. I once got turned down because cocaine would blow away in the back of a pedicab. From many others however who are calling for taxis, I get refused out of hand, or else totally ignored. “Absolutely not!” “No way I’m riding that thing.” “Get out of my way!” I try to wish everyone a good night no matter what they say. On the road I face more negative feelings. Half of taxi drivers will smile at me in empathy or amusement, while the other half will honk at me furiously for being in the way until they pass out of sight. One day a woman in a giant black Yukon tapped the back of my pedicab, a tiny collision. She honked and glowered at me while I checked for damage. Upon seeing that there was no damage, I walked over to her window to ask how her day was going. She told me her day was terrible, and that she would run right over me and my piece of [junk] if I didn’t get out of her way now. The whole time her toddler son looked on silently. I wanted to share with her a moment of being glad to be alive and glad that everyone was safe. I wanted to show I cared about her and help lift her out of her rage. But we did not get to that place. I gave in to her wish that I move, maybe too soon, maybe too late. The Parks Department and the Police and the City Council say “no” a lot too. Pedicabs can’t stop anywhere in Central Park, can’t ride in the Hudson River Park at all, no riding on greenways, nor in bike lanes, nor on bridges. No stopping at taxi stands, nor on busy street corners, no waiting in front of hotels or theaters. And according to the new law just effected this weekend, all pedicab owners must register, inspect, and insure their vehicles, while all drivers must get separate pedicab licenses in addition to driver’s licenses. No new pedicabs may be registered for ownership in New York City for the next year-and-a-half, following the two-month registration period that just passed. The new laws address several aims: safety, accountability, limitation of pedicab quantity, protection of traffic flow, bureaucratic control of pedicabs. Some of these issues make sense–safety matters. But do we want to limit the growth of a pollution-free form of transport? Should we be protecting traffic flow? Is the flow of fossil-fuel traffic itself an unjust system? Shall we allow our drivers, and ourselves, to oppress other species and the children of other nations? I consider whether pedicabs might serve as a tool for nonviolent action. How about a pedicab blockade of a Penn Station taxi stand? How about a “critical mass” of pedicabs across the Brooklyn Bridge? Police have little tolerance for pedicabs. They can fine drivers up to $2000 or seize the pedicab for a minor infraction. The pedicabs themselves cost several thousand dollars. Besides which, many, including mine, are not owned by the drivers, so that a driver who takes action could forfeit his owner’s property and even cause the revocation of the owner’s license to own pedicabs. Direct action using pedicabs could be expensive, short-lived, and harmful to owners. 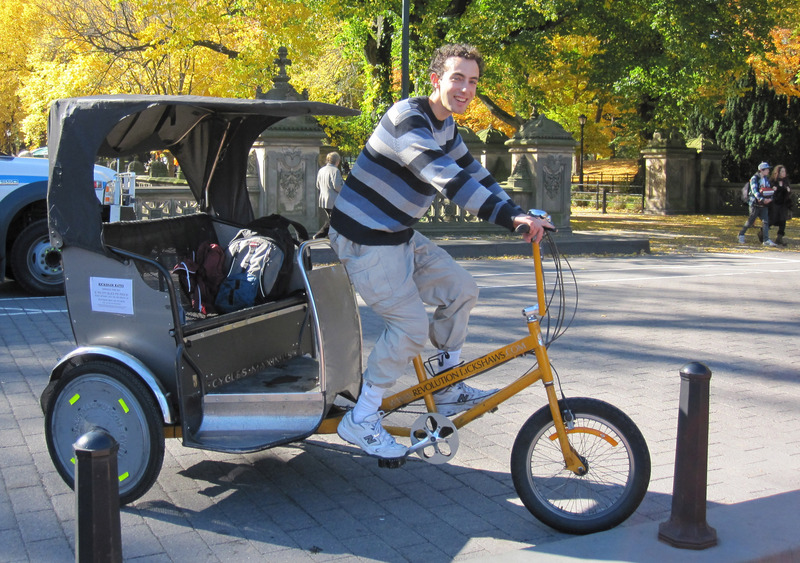 Perhaps the plethora of unlicensed pedicabs that now exist in NYC could be used for action. Perhaps nonviolent action might send pedicabs to fill up the police lot where seized pedicabs go. But while our fossil fuel cars and taxis demand our scrutiny, pedicabs do not provide a scalable solution for the city of New York. They are not cheap or fast enough to transport the masses. Perhaps pedicabs could replace motor vehicle traffic below Canal Street, as they did following the September 11 attacks. But pedicabs will never provide fast enough trans-borough and inter-borough transport to respect the time needs of New Yorkers. I hope that someday soon we might step up our MTA into an excellent public transportation system that is clean, rapid, and consistent enough to appeal to the wealthy as well as the working class, and far-reaching enough to carry people swiftly to all destinations in the city. In my present place, I take concrete nonviolent action by replacing particular fossil-fuel taxi rides with pollution-free pedicab rides. Could I do more? Would I be better to stand by taxi lines offering free transit advice to people waiting, to encourage them to take the subway instead? Would I do better to lobby the city government to replace hybrid taxis with electric taxis, or the MTA to begin a switchover to wind power for the subways? Always I am wondering and looking for the chance to do more. Every occupation offers its own lessons and its own opportunities to practice nonviolence. As a pedicab driver, I have learned a practical lesson about how to be nice to others when they are nasty to me, and about how to remain nice to myself in those situations. There remain always more experiments to be done, more lessons to be learned, and more changes to be made. officer” !!! Remember us ? I sure do hope you will write to me at the email address given above. I´m an English teacher in Brazil and I´m taking some students (all adults) to NY next week. We will take the Bike and Roll tour inside Central Park with a guide but I have a problem because 4 students can´t ride a bike. Then I talked to the lady from Bike and Roll and she told me it would be fine for her to have those students in a pedicab as long as they were respectful and understand that they´re there to follow the group. I liked the way you write and I would like to ask you if you could do that and if maybe you know somebody else who could come with another pedcab. How much would it be? Please let me know as soon as possible because I´m travelling Saturday evening and I need to talk to those students before. Hello from New Orleans, Jonathan. I drove a pedicab from 2006-2011 in NYC. It was marvelous and strenuous depending on the day or the hour; depending on whether people were riding or if they were summarily dismissive; depending on whether I was harassed or even physically assaulted by the NYPD (which I was). So anyway, I just started driving a pedicab in New Orleans this week. It’s awesome. People love us, and the cops don’t mind us at all. Business is always good or great. And there’s no hills in New Orleans, so it’s easy as pie. Well, if you’ve already been a driver in NYC, it’s easy! There’s only 45 pedicabs in the whole city, and until there are changes in the local law and politics, that is the present limit. So, again, fossil-fueled vehicles rule the day here, but at least a pedicab driver can earn a living here in a place without stress and bad vibes from people on the street and in uniform. Come on down to the French Quarter!